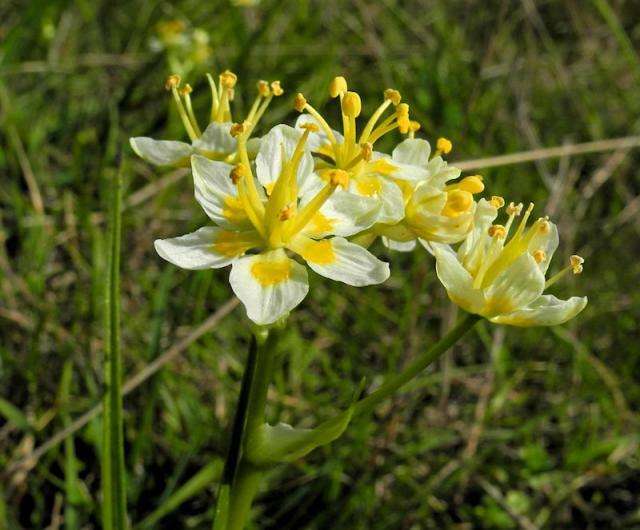 Toxicoscordion is a bulbous genus once considered in the Liliaceae family and now included in the Melanthiaceae family with species formerly included in Zigadenus. Zigadenus has been broken into four additional genera including this one (see Zomlefer et al. 2001). 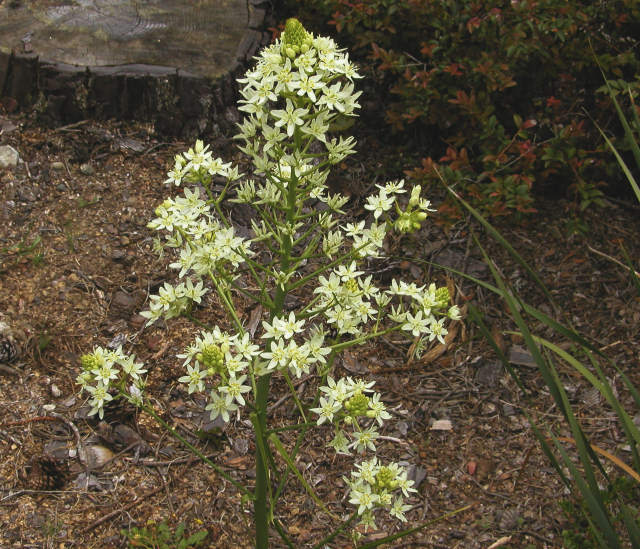 Along with Toxicoscordion, Zigadenus has been split into the genera Amianthium, Anticlea, and Stenanthium. 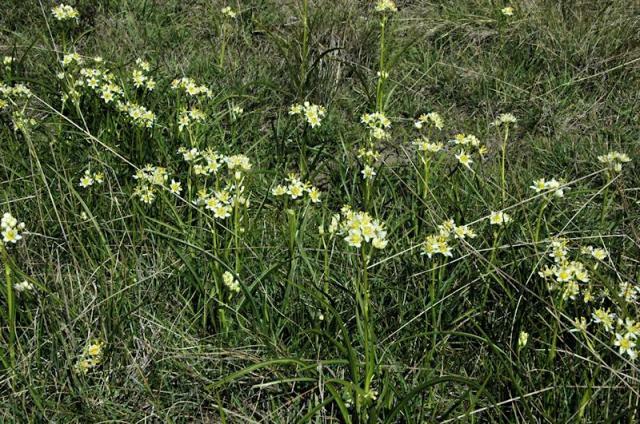 A single species has been retained in Zigadenus, Z. glaberrimus. 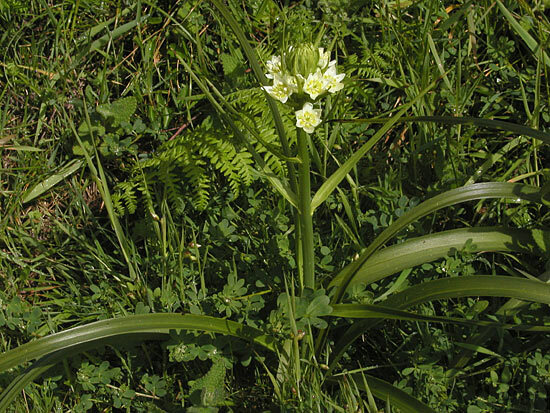 Plants are sometimes called "Death Camas" because of the highly toxic alkaloids which can cause serious problems if ingested. 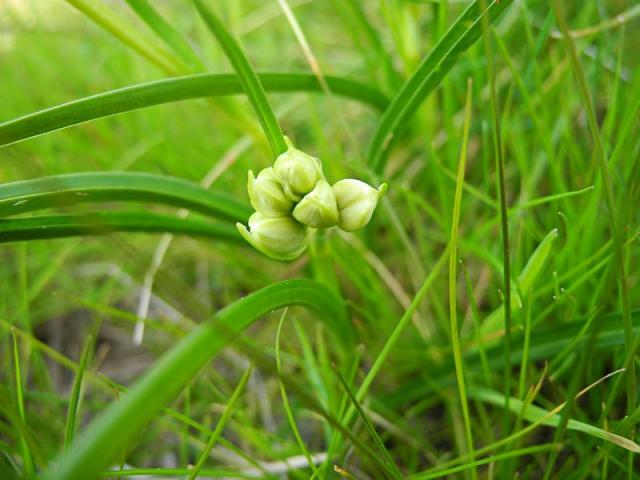 Another common name is Star Lily. 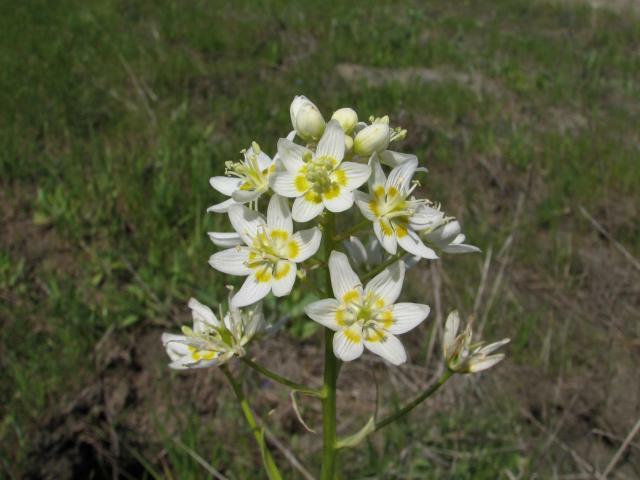 Species in this genus are found in the midwestern United States and in western North America. Kew lists nine species. 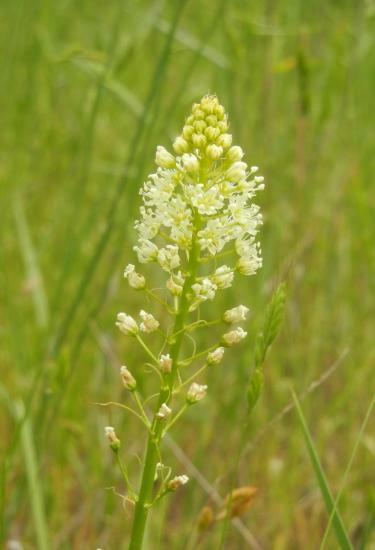 The Oregon Flora considers 8 species but only describes the five that occur in Oregon (exaltatum, fremontii, micranthum, paniculatum, and venenosum). The distinguishing characteristic of this genus from the other former Zigadenus species is that species have tepals with claws and one conspicuous rounded gland (in comparison, closely related Anticlea does not have clawed tepals and has bilobed glands). Jepson offers a key to seven of the species found here: Key to Toxicoscordion. Plants are grown relatively easily from seed. 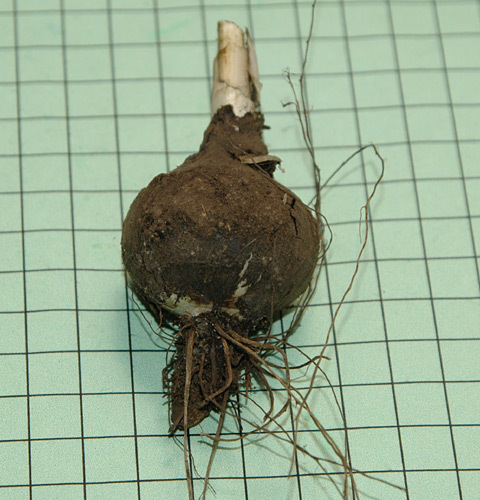 Seed appreciates to be sown at depth, around a half-inch (1-2 cm) in a sandy medium. For hardy species it can be sown in the Autumn and left in pots outside in the Winter. For more tender species, they can be started under lights but do well with some temperature fluctuation. Leave the seedlings in pots for a full year before repotting. 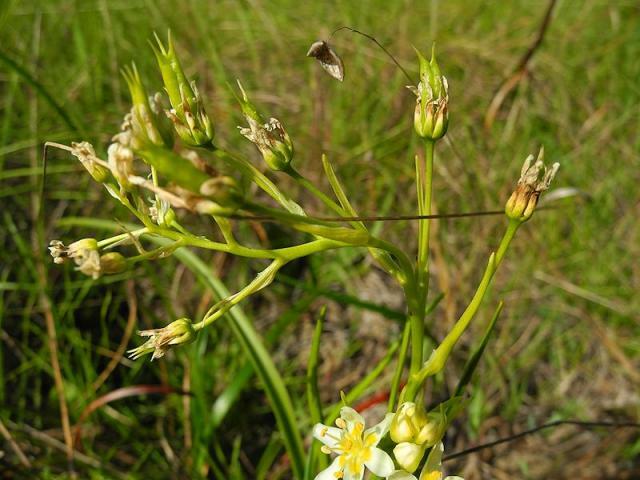 Toxicoscordion brevibracteatum (M.E.Jones) R.R.Gates (syn. 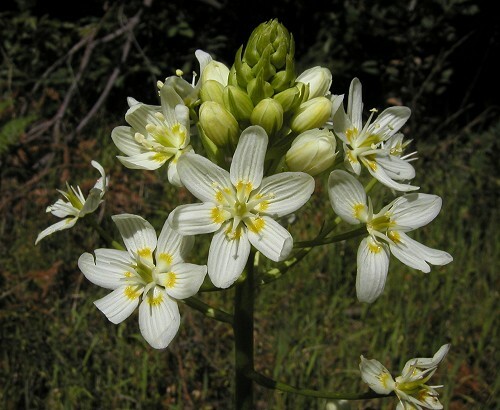 Zigadenus brevibracteatus) is native to Baja California, Sonora, and California, where it grows in sandy desert habitat, giving it the name desert death camas. Grows to nearly two feet tall. Toxicoscordion fontanum (Eastw.) Zomlefer & Judd (syn. 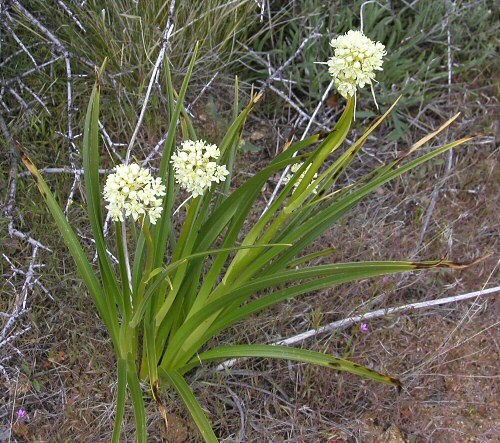 Zigadenus fontanus, Zigadenus micranthus var. 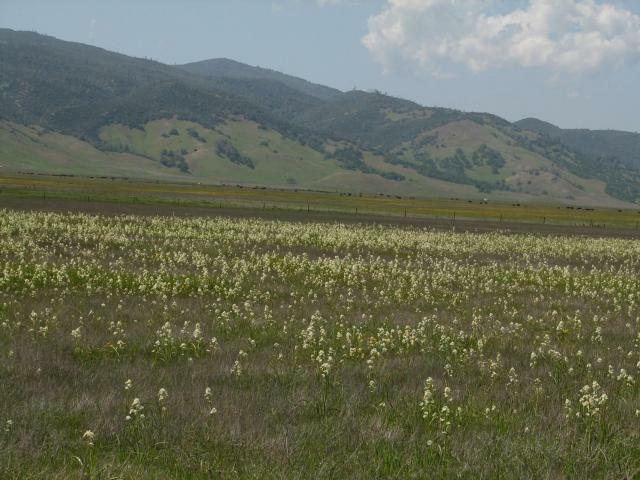 fontanus) is similar to T. micranthum but has a more coastal distrabution and is a California endemic located in the Central and Northern California from the North Coast Ranges and San Francisco Bay Area to the Inner South Coast Ranges (Jepson). Flowers from March to August. 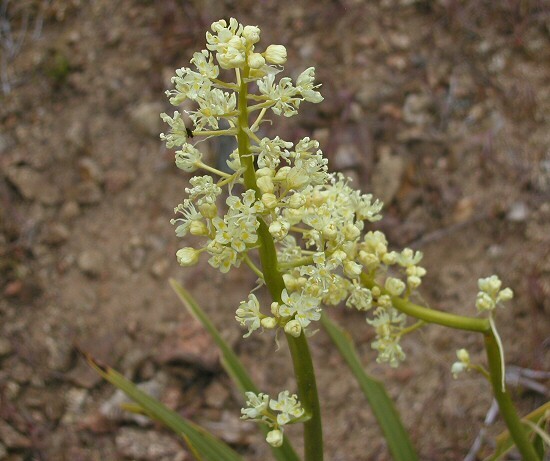 Toxicoscordion fremontii (Torrey) Rydberg (syn. 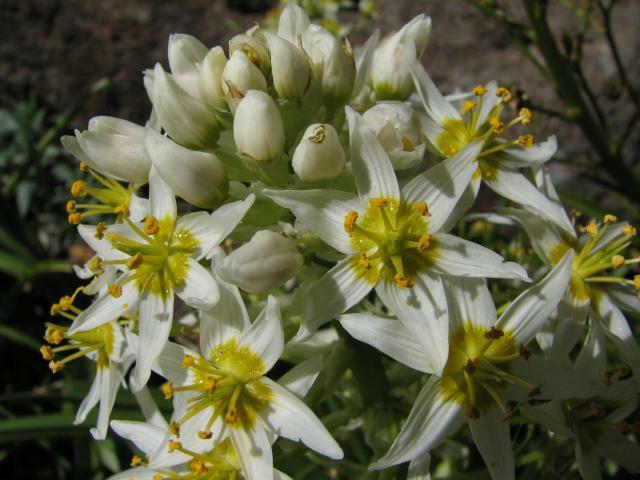 Zigadenus fremontii) is found in the California Floristic Province from southern Oregon south to Baja California. 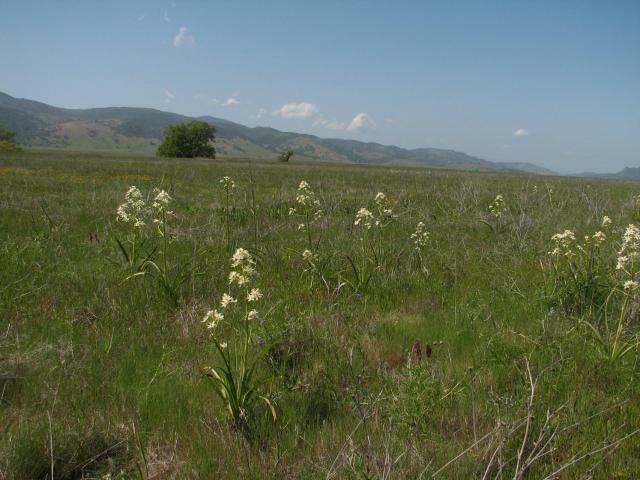 It grows in variable habitats, both coastal and inland, in grassland chaparral and mixed evergreen forests. It flowers from February to June. 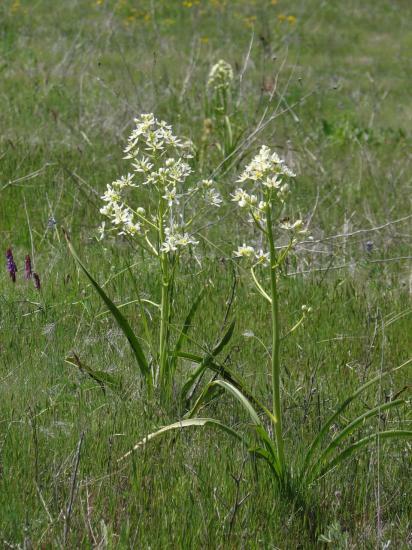 It is very variable in height with white showy flowers in open panicles. Photos 1 from Mary Sue Ittner and 2 Bob Rutemoeller give you an idea of how floriferous it can be and show a close-up of the flowers. Photo 3 shows the bulb on a 1 cm grid. 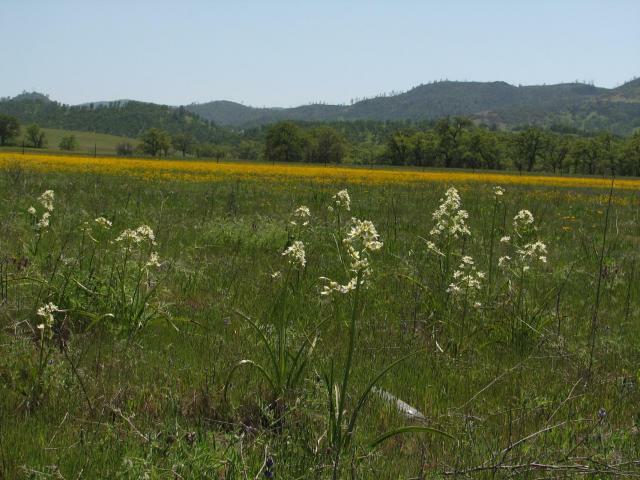 Photos 4 & 5 from Mary Sue Ittner are habitat shots taken in northern California. Photo 4 shows a plant growing near the Pacific Ocean in Salt Point State Park on the Mendocino Sonoma Coast and photo 5 was taken in Mendocino County where they grow on the ridge in mixed evergreen forests. The photos below were taken by Nhu Nguyen in Tilden Park, Berkeley, CA. The photos show how many seeds these plants can produce in a season. The photos below were taken by Nhu Nguyen in Bear Valley, Colusa Co., CA in late April, 2010. The photos below were taken from the Tilden Botanic Garden showing very floriferous plants. Photos by Nhu Nguyen. 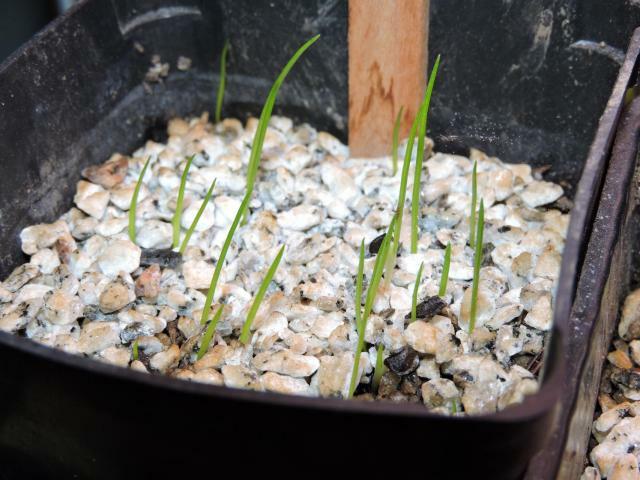 Photos of seed and resultant seedlings of T. fremontii by Travis Owen. 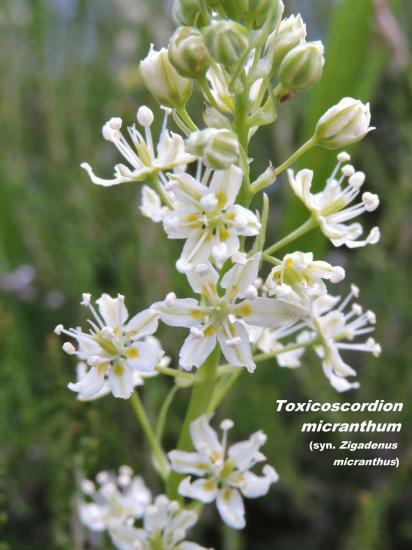 Toxicoscordion micranthum (Eastwood) A. Heller (syn. 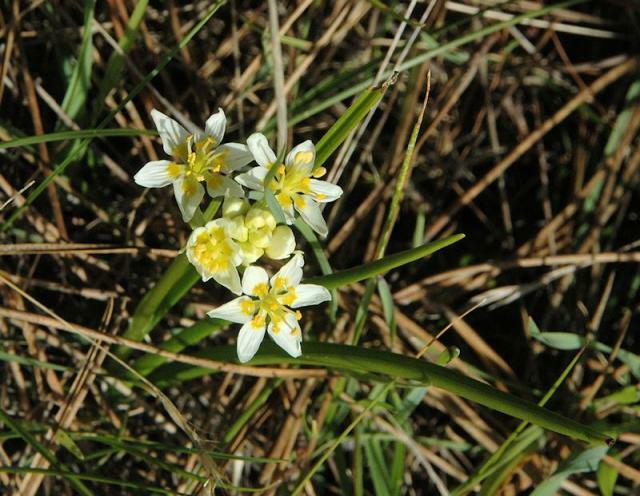 Zigadenus micranthus) is a species with the common name "smallflower deathcamas". 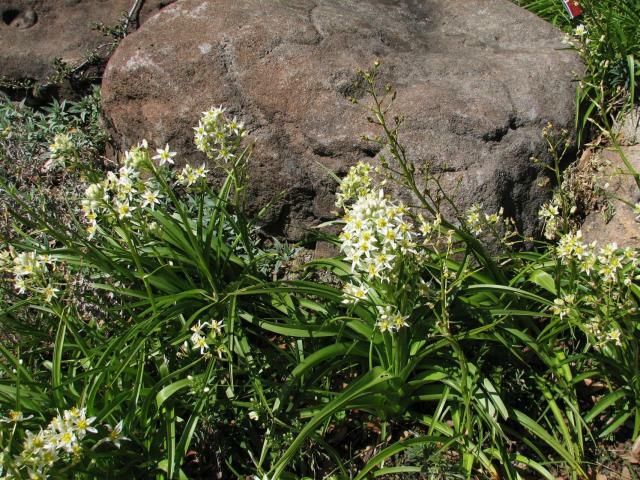 It is native to Southwestern Oregon and Northwestern California, sometimes on serpentine. It has creamy white flowers in a loose raceme and rounded yellow nectaries at the base of each tepal. The tepals are often slightly incurved. 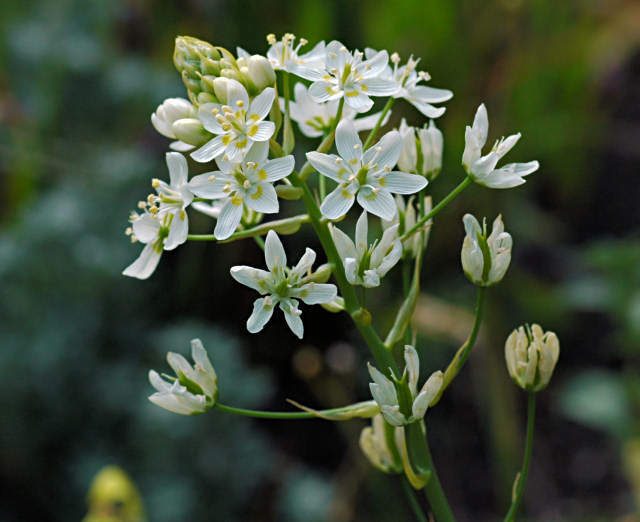 The leaves are thin, less than one quarter inch wide and keeled, shorter than the inflorescence. Basal leaves are few, opposite at the base with smaller leaves alternately whorled on the lower half of the stem. Flowers are born low on the scape towards the ground, the stem elongating to as much as fifteen inches, though often less. 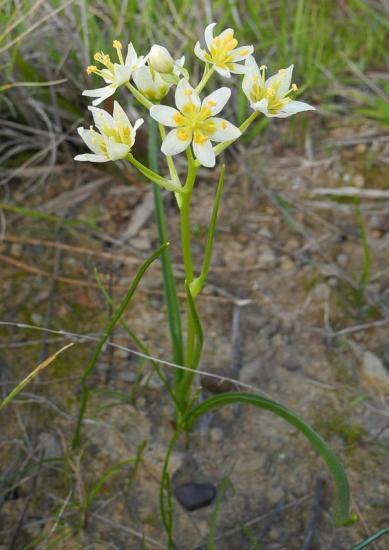 Grows on dry slopes and flats. Photos by Travis Owen, growing in close vicinity to Brodiaea elegans and Triteleia hyacinthina. Toxicoscordion nuttallii (A.Gray) Rydberg (syn. Zigadenus nuttallii, Zigadenus texensis) is native to the South Central part of the United States. Toxicoscordion sp. photos below were taken on The Sea Ranch in Northern California in January 2015 by Mary Sue Ittner and Bob Rutemoeller in a number of locations. Toxicoscordion fremontii is a common plant along the Mendocino Sonoma Coast, but it is a much taller plant and blooms many months later in the year. 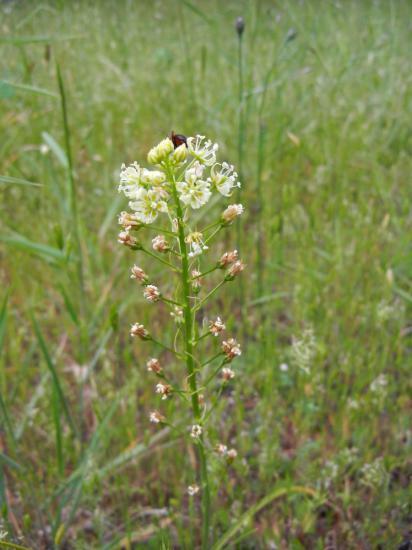 Locals assumed these plants were Toxicoscordion fremontii var. 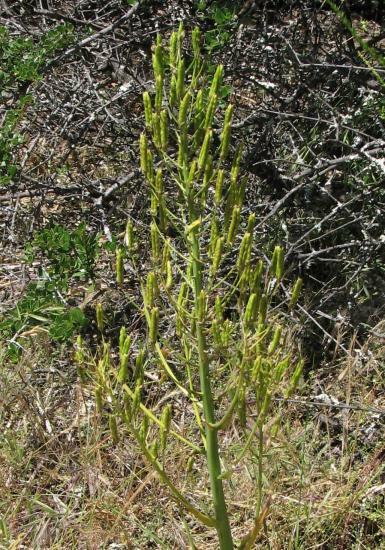 minor, but this variety is no longer recognized and the current description of Toxicoscordion fremontii is stem of 40–90 cm and leaf 20–50 cm, 8–30 mm wide. 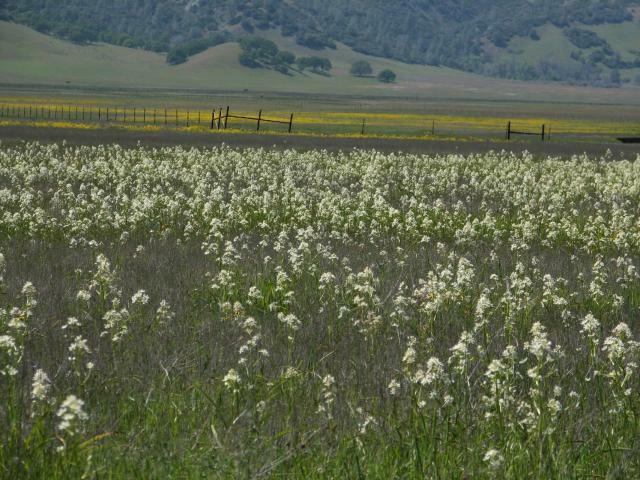 The populations photographed below bloom consistently much earlier every year and are shorter with thinner leaves. Size wise it is closer to Toxicoscordion micranthum, but that species flowers later and grows on dry slopes and flats and the stem of the plants we looked at were smooth. Toxicoscordion fontanum grows on vernally moist or marshy areas and to some degree fits these plants, but that species is described as taller with broader leaves. Plants resembling the ones we photographed also grow in other areas of Mendocino and Sonoma counties. 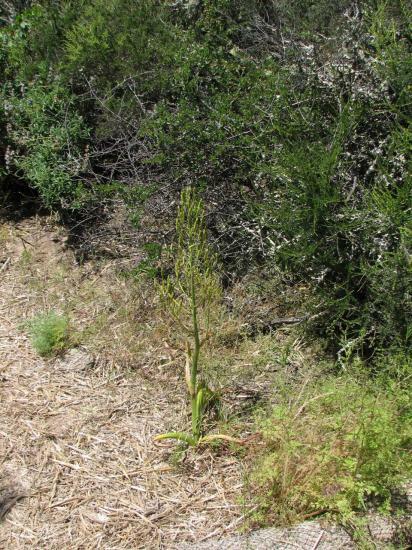 In all the populations we observed we only found one taller plant that more closely resembles the later blooming Toxicoscordion fremontii. 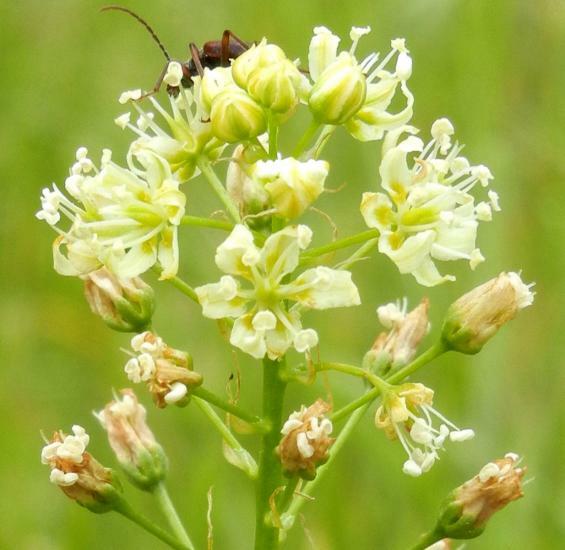 This photograph from Bob Rutemoeller shows it next to a smaller plant. 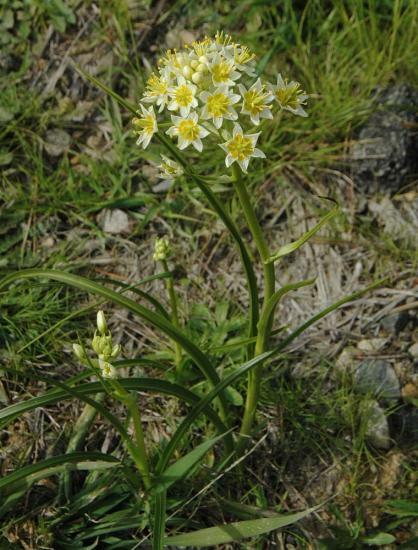 Toxicoscordion venenosum (S. Watson) Rydberg (syn. 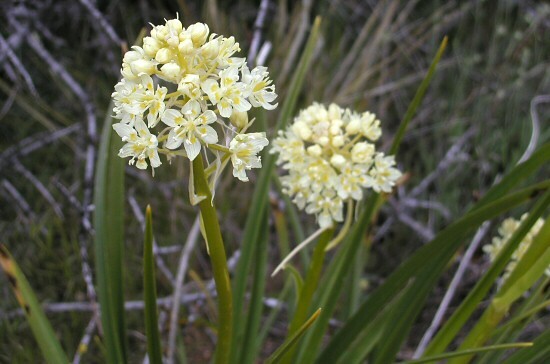 Zigadenus venenosus) is a species with the common name "Death Camas". 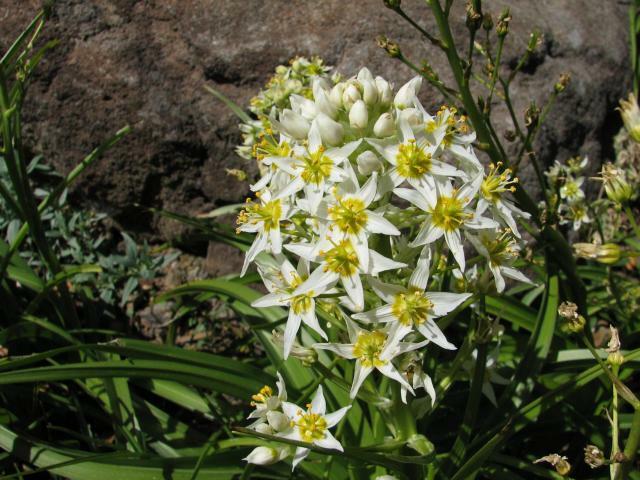 It is found in Pacific States and Canada growing in moist grassy places and has white flowers in a loose spike opening from the bottom up, and a rounded yellowish gland on each petal. Photos by Mary Sue Ittner taken in Kern County at a relatively high elevation in April 2005.